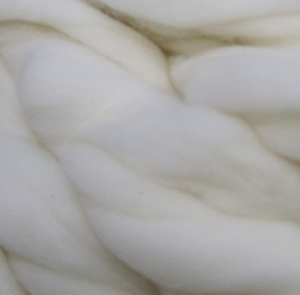 ﻿ Merino Super 150 Fibers from to Weaver Creek Fibers, wholesale purveyors of luxury fibers. While not prized as meat animals, as in other dual purpose sheep breeds, sturdy Merino sheep are known for their dense fine wool with lots of crimp, making for a soft and bouncy yarn. Merino can vary in softness from the astounding and rare 12 microns (softer than any cashmere), to our 15.5 micron Super 150s (cashmere soft), 19 micron Superfine and on to sturdier fiber. It takes dye very well and on its own is prized for softness and in blends with our other luxury fibers makes for a perfect companion. The Merino breed originated in Spain and quickly took hold around the world. Some of the very finest comes from Australia. Our cleaned and combed, Super 150’s Merino top has an approximate micron count of 15.5. Merino sheep is the oldest, most popular breed. A ram has a weight of 175-235 pounds and an ewe has a weight of 135-180 pounds. Merino has a vast micron range, from as fine as 12.5 microns to 24 microns. We regularly carry Merino of 19 microns and 15.5 microns. We consider the 15.5 micron Super 150's merino to be the world's most perfect fiber, having all of the great properties of wool with the fineness of cashmere. This wool is naturally 15.5 microns, not a coarser merino stretched to be finer.